Managing property and drainage infrastructure is essential to minimising risks of flooding. With the impacts of climate change on our environment it is expected that Banyule, as with all of Melbourne, will experience less regular but more intense rainfall and storm events that result in increased risk of flooding. Managing property and drainage infrastructure is essential to minimising flooding risks and potential property damage. In February 2018, we asked for your feedback on Council’s overall flood management performance. A survey was sent to 46,000 households. A total of 2,432 respondents responded to the survey with the majority completing and returning the postcard survey (93%) and one in ten completed the survey online at Shaping Banyule. We are currently reviewing Council drainage guidelines, policies and operational processes to better manage flooding and drainage in Banyule. Operational processes - we are currently reviewing Council processes for stormwater inspections and with the help of new technology, we aim to improve our proactive maintenance program. Building Over Easement Guidelines - we are reviewing the Building over Easement Guidelines to give Council greater access to assets for maintenance and inspection purposes. Capital Works - We are committed through Capital Works funding, to building new infrastructure to protect flood affected properties. Stormwater Guidelines for New Developments - we are reviewing the Stormwater Guidelines for New Developments, to bring Council in line with the new provisions added by the State Government on Stormwater Management. As Melbourne develops and the population grows, the extent of hard surfaces will increase. Climate Change is also expected to increase the frequency of extreme storm activity. We will be looking at the impacts of stormwater runoff and how to manage it and will also look at effective urban runoff through Water Sensitive Urban Design (WSUD) ie. 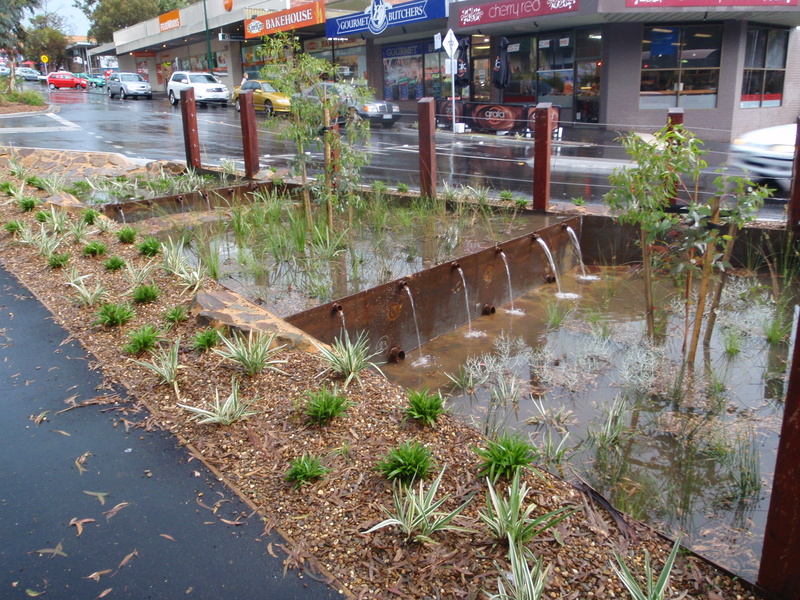 when stormwater is captured and filtered to remove litter and pollutants before being discharged into the stormwater system, rivers and creeks (refer to the photo of Water Sensitive Urban Design (WSUD) in Were Street, Montmorency). Education - We will continue to educate and give advice to the community on how to protect their properties from flooding. Flooding happens for a number of reasons and impacts on individuals and communities in different ways. In an area like Banyule, problematic flooding happens when the amount of rain is too much for the drainage system to handle and storm water overflows onto land. Learn more about local flooding issues by reading an information sheet from Melbourne Water. Flood management throughout Banyule is a joint responsibility between Melbourne Water and Council. You play an equally important role in dealing with flooding. Being prepared is key to managing the risk of damage to your property. During a flood storm emergency remember to contact the State Emergency Service on 132 500 for assistance. We've sent out hard copy surveys and are providing an opportunity for you to have your say. Once we have received all responses we will bring all the information together to get a better understanding of your priorities with drainage. Build over Easement Guidelines completed and adopted by Council. Stormwater Guidelines to be presented to Council for adoption.